After Laura Robinson collects her M.Div. degree May 8 at Emory’s Candler School of Theology, she’s heading to her first post-seminary job at a church in Iowa. In addition to her degree, she’s also bringing her experiences from the school’s first-ever course on Jewish-Christian-Muslim Dialogue, and is eager to apply at her new home base what she’s learned about interfaith relations. Taught at Candler this spring by Deanna Ferree Womack, assistant professor of history of religions and multifaith relations, the course combines readings and study of the three Abrahamic faiths with real-world encounters. Students were required, in addition to their academic work, to participate in several interfaith activities in metro Atlanta. “If we’re going to connect academic study to the way we live in the world, we need to understand and connect with living faith communities,” says Womack. Robinson, who will serve as an associate pastor at Plymouth Church in Des Moines, agrees. “I felt this class was really important to take before I leave seminary and head out into the world of church ministry,” she says. “Something Dr. Womack brings that’s such a gift to the Candler community are the many relationships and connections she’s built around Atlanta and Emory,” says Robinson. Students in the course attended Shabbat services at The Temple in Midtown; visited the Medina Institute Mosque, Seminary and Community Center in Duluth; and participated in at least one of three interfaith dinner-dialogue sessions at different metro locations. Class members also networked in February at the annual LAMP (Leadership and Multifaith Program) Symposium, a joint initiative with Georgia Institute of Technology’s Ivan Allen College of Liberal Arts. This year’s program, focusing on the theme of refugees and asylum seekers, was attended by more than 200 community members and representatives from more than two dozen area NGOs. “We connected with people from all over the Atlanta area who are interested in [helping refugees and asylum seekers],” says Brittani Magee, a second-year student from Norcross, Georgia. In addition to their community work, students undertook readings, analyses and discussions on both historical and contemporary Jewish, Christian and Muslim relations, theologies and practices. They also confronted challenges to their own assumptions about interfaith dialogue. For Rob Levin, a first-year Master of Theological Studies (MTS) student, the big takeaway was that “there are no easy answers in the world of interfaith dialogue.” Although he was involved with Interfaith Youth Core work as an undergraduate, he had not done in-depth study on the theological differences among the three faiths. Tala Alraheb, a first-year MTS student from Palestine, says that when people engage in interfaith dialogue, they often tend to look only at commonalities, and shy away from discussing disagreements. Students in the course predicted that interest in studying interfaith dialogue will remain high. “One of the main things students want to know is ‘How can I bring this information back to my congregation and community to change some of the stereotypes around the Jewish or Muslim faith?’” says Magee, who also works part-time at the Nett Church in Lilburn, Georgia, as part of Candler’s contextual education requirement. “Being able to bring to [church] leadership that there are ideas and resources right here in Atlanta that we can use to begin to have interfaith dialogues is very valuable to me,” she says. Robinson says her new-found connections in Atlanta will help her pursue interfaith work in Des Moines as well. “It’s about gaining more exposure to people already doing this work, which gives you a leg up, especially when you’re out of school,” she says. That's exactly what the professor intended when she created the course. 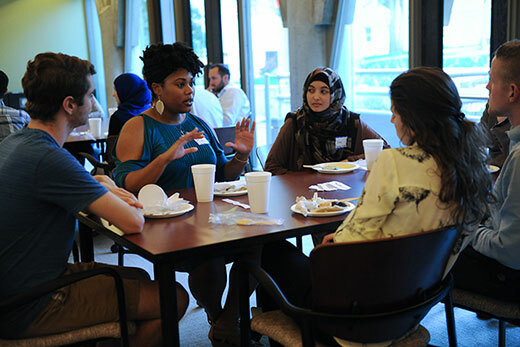 “I want students to have the skills to go to whatever congregation and whatever community they’ll be serving and be able to engage with other faith communities nearby,” says Womack, who received a Community Engaged Learning Grant from Emory’s Center for Faculty Development and Excellence to fund the course’s activities.